Children of the San Diego Public Library Say Yes I CAN! San Diego Public Library Youth and Family Services Program Manager, Marina Claudio-Perez, talks about the importance of inclusion and introduces the Library’s I CAN! Center, a technologically advanced space for children of all abilities. The San Diego Public Library received a CVS Caremark Community Grant to help create the I CAN! Center and to help children of all abilities to learn, play and succeed. All Kids Can Blog: When did you start working at San Diego Public Library? What is your role there? Marina Claudio-Perez: I started working for the San Diego Public Library in 1995 and am currently the Youth and Family Services Program Manager. In this role, I oversee a variety of children’s-focused initiatives including the development of library collections and coordination of system-wide youth services for 36 different library facilities, which together serve more than 1.4 million community members. I also oversee the creation of the I CAN! Center, and manage the Foster Family Teen Center and the Union Bank Homework Center. AKCB: Do you believe the role of a librarian has changed over the years due to advances in technology? MCP: I believe the overall role of a public librarian has remained the same, and that it’s simply the library’s technology and resources that are changing to keep up with the advancement of the digital age. According to a recent study conducted by the Pew Research Center and American Life Project, parents of young children still believe that libraries are extremely important because they help instill their children’s love of reading, provide children with information and resources not readily available to them at home, and because libraries are a safe and welcoming environment. We take these findings to heart and will continue our work as a community service for our patrons to the best of our ability. It is also now important for me and other librarians to watch technology trends and to make changes based on the needs of their community members, including children with disabilities. MCP: The goal of the I CAN! Center is to create a library space for children with disabilities and to provide children of all abilities with equal access to library resources. Thanks to the grant from CVS Caremark, The I CAN! Center will provide a friendly, inclusive atmosphere, with resources geared to children ages 0-12. We are working to ensure that the center meets the needs of all children, by providing an array of stimulating and accessible technologies, including TAP-it®, an interactive learning station designed to provide accessibility to children of all abilities. AKCB: Please describe the technology that will be used in the I CAN! Center and how it helps children? What does TAP-it® do? MCP: The I CAN! Center will provide children with the right technology to meet each and every one of their individual needs. We have installed touch screens, text-to-speech software, text magnifying software, and other assistive equipment. TAP-it® is one of our most exciting technological additions to the center. It is the first ADA compliant interactive learning station for children with disabilities. The units assist visual, auditory and tactile learners and are all within reach for students using wheelchairs, walkers and other mobility devices. The I CAN! Center will also have ADA-compliant furniture, adaptive and sensory toys, Braille and audio books, and parenting resources. AKCB: Please describe your work with the I CAN! Center. MCP: For the I CAN! Center in particular, I take part in the actual design of the space and am helping to coordinate this new service for children of all abilities. I am currently transitioning our new Manager of the Sanford Children’s Library to take over this role, but will continue my work in designing additional youth service programs for the San Diego Public Library. AKCB: What has been your favorite part of being involved with the I CAN! Center? MCP: Being able to support children of all abilities within the community has been a goal of mine for a long time and I’m finally seeing our team’s dream come true. 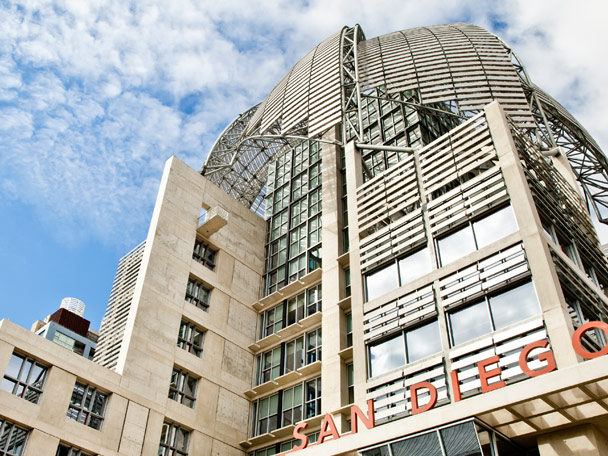 With the opening of San Diego's New Central Library, we have a full wheelchair-accessible center that provides us with expanded space for collections, programming, technology, and literacy services for all visitors. Our new I CAN! Center, located within the new Central Library, is our first step to providing educational services to elementary age children with disabilities, and I’m excited for what’s to come. AKCB: Do you have any personal stories to share about the potential impact of the I CAN! Center? MCP: The TAP-it® technology will make a huge impact here at the I CAN! Center. There is no greater joy for a librarian such as myself than seeing a child’s eyes light up with excitement, which is exactly what I have been able to see in simply watching children test the new equipment. The potential for community impact here is truly endless. I’ve recently met with educators and psychologists who are joining in our efforts within the I Can! Center, and offering their services because they believe in the library’s goals of inclusion. We’re no longer just a library, but rather a community working together to make a difference in the lives of children of all abilities. All Kids Can thanks Marina Claudio-Perez for speaking with us about the San Diego Library’s I CAN! Center and for helping children of all abilities experience the joy of reading and learning together.